Smart has lived in Tuscany since mid 1960. He has a strong international following and while represented in all Australian public galleries also has works in major collections overseas including the New York Metropolitan Museum of Art. 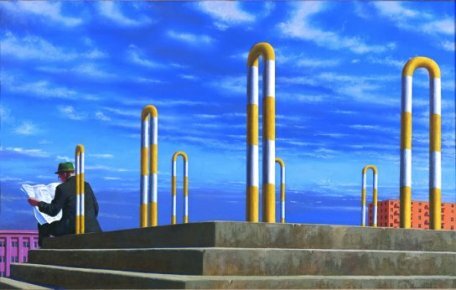 He exhibits extensively both in groups and solely throughout the world and was awarded the Australian Commonwealth Jubilee Art Prize in 1951. Smart studied at the South Australian School of Arts, 1938-41, and then taught until he went to Europe in 1948. He studied in Paris first at the Academie Grand Chaumiere then at Leger's Academy but owing to money shortages had to return to Australia in the early fifties. He worked at various jobs including the ABC in Sydney and by 1964 had earned enough to return to Europe. He became a full time painter at the age of 41. His style does not classify easily into a modernism. His paintings tend to be of urbanisation and architecture. Like Cezanne, Smart believes pictures should stand on their own in purely visual terms. Smart's work is meticulously constructed; he tends to use the classical form in a contemporary setting and applies to his composition the same geometrical principles employed by Piero della Francesca^ and used in the construction of the Partheon. He has visited most of the ancient sites in Europe. When viewed all the work gives the impression of stillness. People appear snap frozen, the lighting arranged as one might light a stage holding the composition in a vice-like grip, never suggesting nature. Although the moment is frozen there is no story telling but rather a created apprehensive concerning the next unforetold event - the work points to the next event which may threaten serenity. Smart pictures may look realistic but he often suspends the laws of motion to misrepresent, for example he may force the idea of movement by stressing the opposite direction so that a newspaper in flight will be in total focus and its shadow will have equal importance and be shown in minutest detail. ^Piero was born in Italy around 1410 and is now regarded as one of the best Quattrocento artists.